While the Boston street above teems with pedestrians, trucks, busses and cars, a small crew of subterranean workers is guiding a 72-in-diameter sewer pipe through soil full of obstructions in one of the longest, toughest and most unusual pipe jackings in New England history. Two shifts of five-man crews of Caron Pipe Jacking, Inc., a Berlin, Ct. firm, are working in the steamy hot and oftentimes smelly - confines of the specially fabricated concrete conduit which will carry sewage to the proposed new treatment plant at Deer Island. Caron has a subcontract to J.F. White of Newton, Mass. to jack about 1000 feet of the super-heavy pipe beneath Atlantic Avenue near South Station, scene of some of the heaviest traffic in the City of Boston. Because of the traffic, White's engineers decided to jack the pipe rather than attempt to open-cut the trench which would have squeezed traffic into fewer lanes in the already constricted thoroughfare. The 1000 feet of pipe is divided into three sections of 250, 320 and 430 feet. The latter two sections are so long that the engineers opted for an intermediate jacking station to relieve stress on the pipe, something that has never been done before in New England. As explained by Caron's project manager William Lane, a jacking operation usually involves a jacking pit, where the powerful jacks are located, and a receiving pit at the other end of the job. The first section of pipe to penetrate the earth is protected by a steel tunnel, or steering shield. Small hydraulic jacks on the shield are activated by the workers to steer the pipe, keeping it on line and grade as it is pushed through the soil. Four 300-ton jacks do the pushing. As the pipe moves forward, laborers within, armed with shovels, excavate the material inside the pipe, placing it on a spoils cart which when full is pulled back to the jacking pit and raised to the surface by a street level crane for disposal of the material. 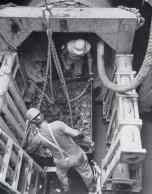 In the jacking pit, the men continually insert spacer blocks between the jacks and the push frame mounted on the end of the pipe. When enough spacers have been inserted, the men remove and replace the blocks with another section of pipe, and so the process continues. The ever-lengthening pipe inches its way forward through the ground like some giant earthworm, soil passing through its body to be cast behind, in very much the same way that it happens in live worms. As the process continues, however, great pressures begin to build up on the ends of the pipe, threatening to crush it. The longer it is pushed, the greater the forces. The intermediate jacking station now installed in the longest section of pipe is helping to reduce those stresses to tolerable levels, said Lane. The brainchild of Brian Crandall, a New Jersey consultant, the station was rented by White and installed by Caron after about 215 feet of pipe had been jacked. The station itself was pushed forward into the earth as more pipe was added behind it. Periodically, the station's own jacks are operated remotely by surface controls, forcing the front 215 feet of pipe gradually forward about 12 inches. The four jacks in the jacking pit are then activated, pushing the rear section of pipe forward to close the gap between the two segments. The system has been working well, Lane noted, in spite of the worst conditions he has seen in his 25 years in the business. "Normally, with a pipe this size and average soil conditions," he said, "our crew would be advancing pipe at the rate of about twelve feet in an eighthour shift. We're lucky now to get six feet in a shift, and sometimes, we've gotten as little as two feet. The reason is the number of obstructions we've hit." "We've run into brick sewers, buried walls made of timber cribbing and stones, and hundreds of wood piles. This entire area around South Station was filled in years ago. There are even buried streets here." When a cribbed wall or timber piles are encountered, Lane said, his men have to use an electric chain saw to slice through the wood, and remove stones by hand. Only then can the pipe be jacked once more, and the soil removed. It's a slow dirty process, he said, all hand work with room for only one man to stand ankle-deep in muck and work the six-foot face of the tunnel. 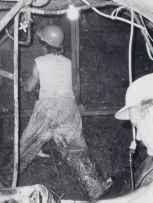 Perhaps the most disheartening part of the job, he said, was when the pipe came up against a solid wall of concrete. It turned out to be a buried pedestrian underpass, constructed of 30-in-thick walls. "The men had to break through those walls twice," he said, "using hydraulic drills, rock splitters and torches to cut the rebars." He credited J.F. White for its outstanding support of Caron crews, noting that the Newton contractor had dug the pits, boxed in all utilities unearthed during the operation, and provided a crane and operator at the jacking pit for hoisting the tunnel spoils cart and lowering the eight-foot-long, 9-1/4 ton pieces of sewer pipe. The reinforced concrete pipe for the project was specially designed and fabricated by New England Pipe Co., he said, and features 8-inch-thick walls, steel collars on the bells and spigots to withstand the jacking forces, and a number of grout holes around the perimeter. "The holes allow us to pump bentonite slurry to the outside surface of the pipe," explained Lane, "which acts as a lubricant to reduce skin friction and ease jacking." Lane said that his firm had been lucky in finding reliable local help for the two shifts working the unusual jacking operation. "It's not easy finding men willing to do this kind of work," he said. "We usually provide the key supervisory people and try to hire local laborers. Many times, we'll have a man work with us one day, and he won't show up for the second day's work." Caron is one of the biggest pipe jacking firms in New England, he said, but it only employs about 25 people. It's essentially a family business, he noted. You have to grow up in it, or you wouldn't stay in it. "This pipe is a relatively large one," he said, "but we have jacked pipe as small as 30 inches in diameter. There's so little room that the man working the face has to use a shortened shovel, which we make by simply cutting out the wooden handle and welding the shovel to the steel grip. "You don't stay in this business if you don't like confined places," he said.